Steve Swanson wakes in hospital to be told he has just had a brain tumour removed: his unborn identical twin, Rupert. 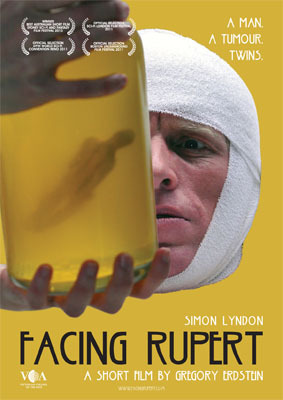 Synopsis: As Steve's health slowly declines in recovery, his brother, now kept in a jar beside the bed, begins to grow. An increasingly jealous Steve can only watch as Rupert steals the attention of his doctors and his nurse. Only when their prick of a father Steve Sr. turns up for a visit does Steve begin to realise that Rupert may be the only real family he has ever had.